No doubt the industry is welcoming a new musical invention. A talent that has poetically emerge into the Nigerian music scene, at a period where values for genuine hip-hop music is fading into thin air. Born January 27, Adegbembo .L. 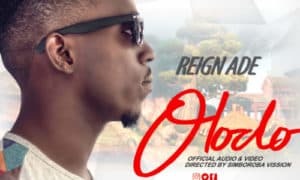 AdeDamola who is popularly known as ‘Reign Ade’ started his musical journey at age 13, with an eye for the basics, he started writing songs and verses and would play around it with friends in his neighbourhood. Reign Ade who’s decent of Ondo State, graduated from Naija Delta University where he Studied Electronic Engineering. His love for good music reflects in his dexterous display and salient lyrical contents. Because of his unassuming talents, one of Nigeria’s fastest-rising Record Labels, SIMBOROBA RECORDShas given ‘Reign Ade’ the opportunity to expend his voice and imprint his essence in the Music Industry. Reign Ade just penned a recording deal with Simboroba Records. The deal tends to open massive doors for Reign Ade to pour out the musical contents hidden in his bowels.